One of the best benefit is that all members have voting power for who will sit on the ODTUG Board. The Board is a powerful group of volunteers that controls, coordinates, and organizes the content, activities, conferences, and events for the community and its members. In essence it is a user group that is run by users, for users. 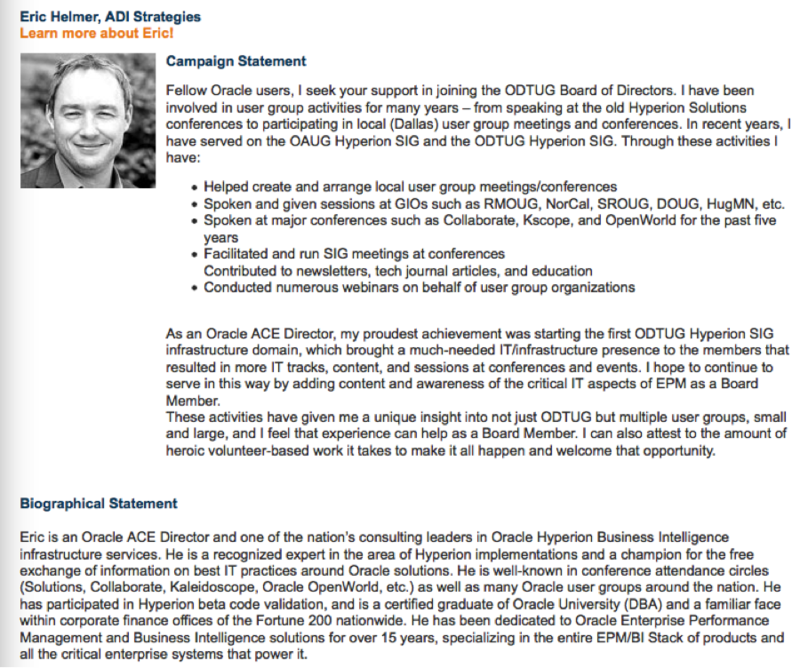 The ODTUG is very near and dear to my heart as it has a lot of emphasis on EPM and the content is technical in nature. So, if you are member, please help ensure your voice is heard. There are 5 seats available this year. You will be able to vote for 1 to 5 candidates. One of the candidates you might see is me…. I would appreciate your vote. You will need to log in with the email address and Voter ID that you were sent in the email. If you did not receive an invitation to vote, click on the help button and request it to be resent, using the email address that’s associated with your ODTUG profile. 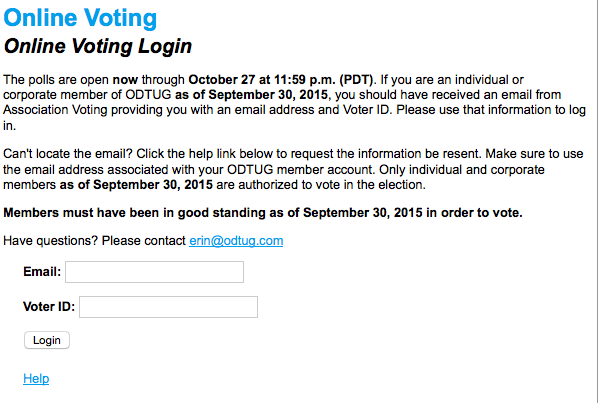 Again, voting is only open for ODTUG members. Choose up to 5 candidates by selecting the box next to their picture and submit. That’s it! Voting closes on October 27th. Be sure to Tweet to all your followers that you voted. Use #Vote4Eric to help support me. Thanks for your support and membership to the ODTUG. ~ by Eric Helmer on October 6, 2015.